These workshops are intended for existing neighborhoods which have already been built out, and where the original developer is no longer involved. There are two decidedly different sorts of neighborhoods, each requiring a different sort of workshop: traditional neighborhoods, and sprawling subdivisions. Traditional neighborhoods built before the rise of the automobile were almost all compact, mixed-use, and walkable… because they had to be. The "bones" of these neighborhoods are usually good, but because they are older, they may have lost some of their original vitality, especially if many of their residents moved out to the suburbs at some point. This workshop therefore focuses on restoration and revitalization. 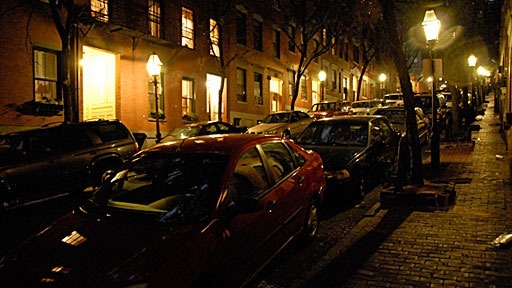 Traditional neighborhoods usually were founded before the advent of the Neighborhood Association, so most of them do not have neighborhood management that carries the force of law. They do, however, often have some sort of neighborhood leadership group. The day begins with a 1-hour meeting with this group. It is a high-level overview of the Original Green and its impact upon neighborhood development. Neighborhood groups usually have a sense for the inherent values of traditional neighborhoods, but aren't usually able to articulate it so well. This two-part session lays out a number of plain-spoken ways of getting these benefits across to those who might choose to live in your neighborhood or open a business there. After that, we'll look at some of the latest grass-roots ways of getting the word out. Neighborhood restaurants and retail, if done properly, can do much to revitalize a place. Done improperly, they can do a lot of damage. Offices and other workplaces can be damaging as well if built improperly. This meeting with neighborhood business owners focuses on techniques for improving the physical design of neighborhood commercial establishments. The Infrastructure meeting should include all team members who manage the infrastructure of the neighborhood. It is extremely helpful if representatives of the city departments that deal with infrastructure could attend. Typically, this includes engineering and public works departments. We will review your current practices and suggest a number of Transect-based methods whereby your infrastructure can be more sustainable. Because we rely on Light Imprint methodologies, we will include environment-saving and money-saving solutions from this toolkit, too. Places with recognizable architectural character often have more value than those that do not. Preserving that character can be difficult, however, because most builders default to today's suburban construction practices that have little or nothing to do with the character of historic neighborhoods. This session lays out tools that are available for preserving the character of a place. Many far-flung subdivisions built in sprawl simply won't be inhabitable once gas gets too expensive. The solution is to begin repairing the sprawl now, so that these places become more compact, mixed-use, and walkable beginning now. Of all our workshops, this one likely is the most vital because no urban form today is more unsustainable than sprawl. The day begins with a 1-hour meeting with the Neighborhood Association. It is a high-level overview of the Original Green and its impact upon neighborhood development. We spend the remainder of the day looking at sprawl repair techniques because there are so many things to look at. Generally, sprawl is composed of single-use pods of housing, retail, offices, and recreation. These techniques have broad implications for everyone living or working nearby, so this session is open to anyone with a home, office, or store there. Have a look at this Sprawl Repair site to get a sampling of the things we'll be looking at.